Dimensions: 15.50" Overall Length x 14.50" Body - 2.50" Inside Diameter Inlet and Outlet x 3.5" Round Body. Aero resonators are built to perform under any condition. Manufactured out of the highest quality T-304 stainless and sound absorbing material. These will reduce rasp and drone in any exhaust system. 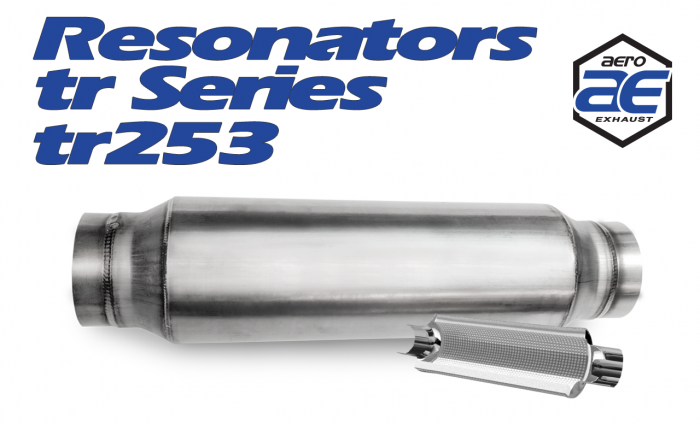 The tr Series Resonators are the most popular resonators we offer because of it´s versatility to fit in tight locations on most vehicle applications. It is a perfect resonator to tone down the noise levels and eliminate the rasp on your car, truck or SUV. Eliminate Rasp and Drone while Increasing Exhaust Flow!